Exhibitors at the International BoatBuilders&apos; Exhibition & Conference, which wrapped up Thursday, were generally pleased with the event&apos;s new Louisville, Ky., venue, as well as the business they did during the three-day show. "We were a little concerned coming down because of the change of venue from Florida, but it&apos;s actually had a lot of traffic," said Bob Grenke, Molex product manager, on the show floor in the final hours of the event. "We&apos;ve had some really good leads, some really interested people, some existing customers, which is nice, too. We&apos;ve found it to be a success." "Anytime you have a change, there&apos;s always a concern. And since we moved from Florida - where you would think would be one of the boat capitals of the world and it is - moving up to Louisville, which is in the heart of the Midwest basically, we were a little concerned," he added. "But I think people found it was very economical to come here ... and we found it very accommodating. Costs have been less and I think there&apos;s more people here this year. It seems like there&apos;s more people coming through." Final attendance figures were not immediately available, though organizers said preregistrations were up about 12 percent over last year. "We&apos;re surprised at how good it&apos;s been; it&apos;s certainly better than last year," said Ed Dickson who works in sales for Imtra. "I found it to be very convenient and I&apos;ve seen some very good contracts. [Wednesday] was very busy. It&apos;s better than we expected." First-time exhibitor Chad Williams, vice president of sales and marketing for PierVantage, agreed IBEX was a success. "It&apos;s been great. We&apos;ve spoken with a number of potential customers, both for our PierVantage product, which is our boatyard management solution, as well as our customer experience portal, which is our marine supply business-to-business e-commerce portal," Williams said. "So we&apos;ve spoken with a number of clients and potential clients and it&apos;s been great. ... We have demonstrations going on and we&apos;ve had pretty constant traffic. We&apos;ve been pretty busy the whole time." IBEX 2010 featured more than 500 exhibitors and organizers said they heard very few complaints about the show or the venue. "I have spent all of the last two days walking the show floor and I&apos;ve talked to every exhibitor who isn&apos;t occupied with a customer," NMMA president Thom Dammrich said Thursday. The National Marine Manufacturers Association co-produces the show with Professional BoatBuilder magazine. "I bet I talked to 150 to 200 exhibitors and I haven&apos;t found anybody who&apos;s not happy with the show. Most are extremely happy,"
Show co-director Carl Cramer, publisher of Professional BoatBuilder magazine, said he&apos;s used to fielding complaints from exhibitors but heard few this year. "People go out of their way to praise the facility, how helpful the staff has been," he said. "The downtown has been so welcoming to us. The exhibitors and the attendees that have come to me are wowed. Overwhelmingly, I think the level of satisfaction has surprised many people." 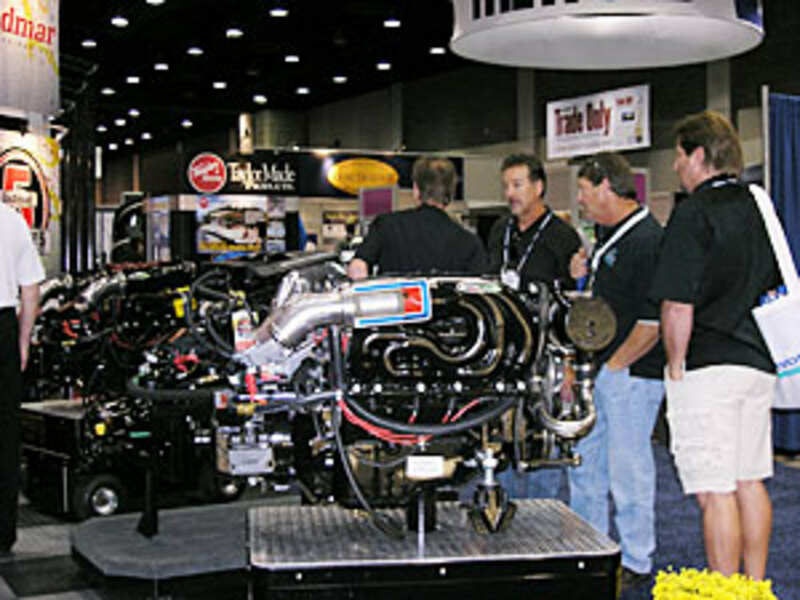 IBEX 2011 is scheduled for Oct. 17-19 at the Kentucky Exposition Center in Louisville. A complete show wrap-up will be published in the November issue of Soundings Trade Only.